At under $5.00 a pound, irresistible Lobster becomes even more so. We brought home the store’s maximum order of six, 1-1/4 to 1-1/2 pounders, streamed and cracked. Cath craved for her usual, steamed with Melted Butter, while I craved for spicy Fra Diavolo. As shown, we both got our cravings satisfied, with ample leftovers for picking at lunch. 1. Cut the Lobster in half lengthwise. Remove the Tail meat & the Claw meat. The remainder can be saved for stock. 2. In a large saucepan, heat the EVOO & Garlic & cook for a few minutes. Add the White Wine, Tomato sauce, Red Pepper Flakes & Capers. Cook for a few minutes until all the ingredients have blended together. Add the chopped Parsley & Salt, to taste. 3. Add the Lobster Meat. Do not overcook the (already steamed) Lobster, You simply want to warm & mix them together. 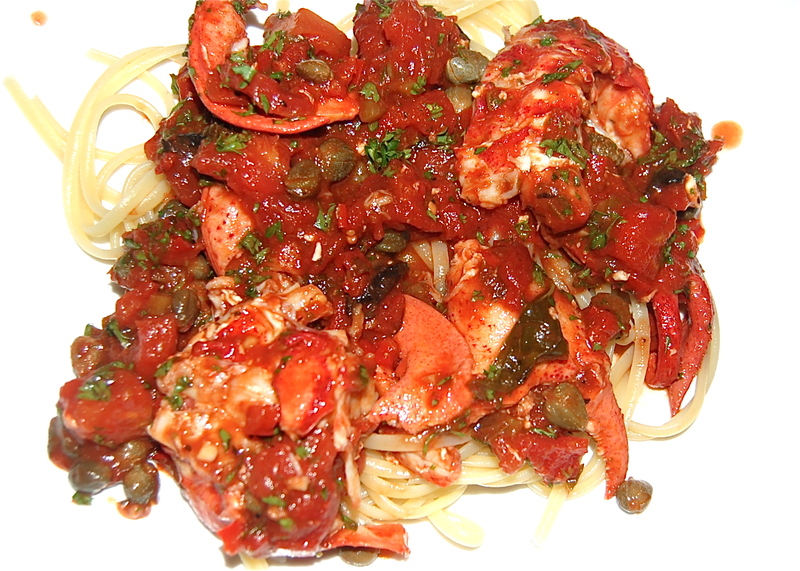 Add the Lobster & Sauce to the cooked Linguini & serve. This looks so good. I’m going to plan this for a treat this weekend. Love you both. This looks so good that I’m going to try it out this weekend. Love to you both. Maugh (kisses).